Hey there, Tessa's mom. It is so good to hear from you today. And thanks so much for taking the time out of your busy schedule to come here and share your German Shepherd puppies Tessa's stories with us all here today. What a beautiful German Shepherd puppy Tessa is. Love the picture too - she looks so happy, sweet and comfortable just hanging out waiting for something fun to happen! Your German Shepherd puppy Tessa is absolutely beautiful. And I am sure she is going to make you a wonderful companion. I just love her coloration. 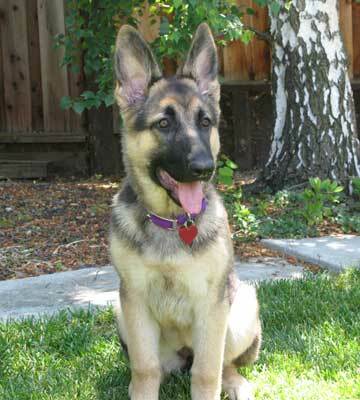 Lovely puppy - she'll make a beautiful German Shepherd Dog.Good luck with your newest German Shepherd puppy Tessa.